Even organized people find moving very stressful, and so they ease the burden by hiring professional moving companies. But looking for the right moving company isn’t as complicated as one might think. We’ve broken it down into 5 easy steps. If you care about your belongings, then you can’t just Google “moving company northern virginia.”, And randomly pick one of the companies on the list. Are you ready to hand over your precious 100-year old family heirloom, your expensive piano or the glass cabinet that is so delicate to somebody you contacted online or through the phone book without researching? We would hope not! So, how do you choose the mover you can trust? Ask family, friends, coworkers, and local real estate agents. Select a moving company that someone you know has hired before and recommends you to do the same. Look in the phone book and on Google Maps for professional moving companies that are closest to your home. Ask for a business card or look up the mover’s website and find the registered address online. Make sure the moving company’s address is the same as the one on the business card given to you. Be wary of any address listed under a residential name. Avoid any companies you feel are shady. Always confirm the company’s license through the U.S. Department of Transportation Federal Motor Carrier Safety Administration’s website and ask them for the moving company’s U.S. DOT number. You can use the company’s DOT number in case something goes wrong, and you need to file a claim against the company. If you’re staying in state, check with your local consumer affairs agency. It is also a good idea to contact the BBB and ask them if the company you want to hire have any black spots on their track record. It is always a safer bet to hire a company that is listed by the BBB or at least have a good rating. If you can’t find information about a company at the BBB, then it is better to avoid the company entirely and look for another one. Make sure you get an estimate of the cost before you sign any contract or make any deals and make sure you’ve shown them everything that you want to get moved. Do not pay anything in advance as professional companies do not require any advanced payment. Some moving companies even offer a free estimate on the cost of your relocation. Now you can select a mover. If you follow these steps correctly, you should be able to find the right company. Simply replicate the steps for each moving company that you’re considering. If you’re short on time, click here. 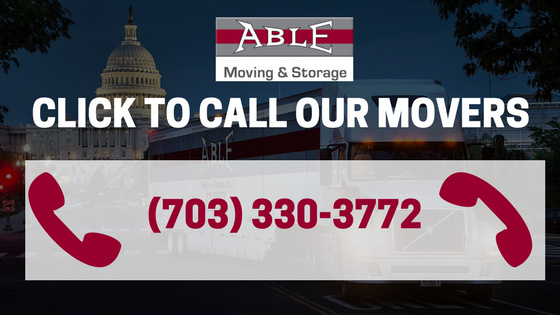 Able Moving & Storage, Inc. will take care of you in quick and professional fashion.